TV show dates: December 22, 2017 — May 8, 2018. 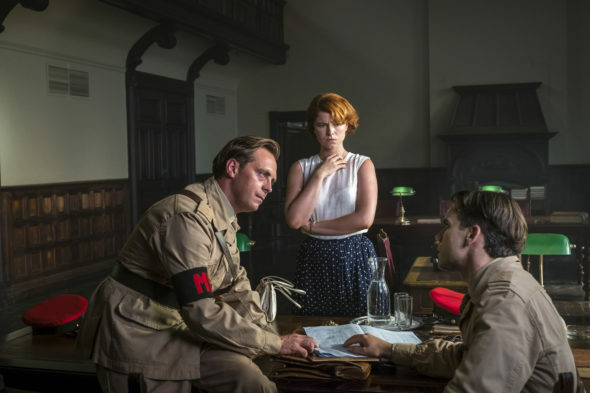 Performers include: Ben Miles, Jeremy Neumark Jones, Stephen Campbell Moore, Jessie Buckley, Amanda Drew, Jessica Raine, Essie Davis, Tom Glynn-Carney, Louis Greatorex, Chris Reilly, Kevin Sutton, Paul Tinto, Toby Woolf, Ouidad Elma, Andrew Havill, Joseph Kennedy, Richard Dillane, and Aymen Hamdouchi. A 1960s military historical drama from creator and writer Peter Moffat, The Last Post TV show unfolds in Aden, Yemen. It revolves around the officers of a Royal Military Police unit and their families. The British drama originally aired on BBC One in UK. The story centers on the men who serve as soldiers and police officers. Since they are also husbands and fathers, it is not just their lives on the line. Their families are also at risk of any uprising or threat. It is not only the men who are called to sacrifice by the very nature of their positions. Their wives also feel the pressure to conform to life as a military spouse, while still feeling the pull to be themselves, far from home, at the dawn of a new age. Despite the ever present danger of hand grenades, mines, and sniper attacks, life goes on and so does love. And now, in the swinging ’60s, the siren song of sexual liberation is ringing in everyone’s ear. New on the scene, dapper and debonair RMP Captain Joe Martin (Neumark-Jones) and his bride, Honor (Buckley), have an aura of glamor to them, not unlike JFK and Jackie. Posting to Yemen seems, at first, to be just another adventure in their new life together, but does Honor really understand who her new husband is? Although he has been stationed in Aden for some time, and expected to replace Captain Nick Page (Kennedy), Lt Ed Laithwaite (Moore) is passed over, in favor of Joe. Meanwhile, Ed’s wife, Alison (Raine), who has been having an affair with Nick, takes Honor under her wing. Lively, witty, and thoroughly modern, Alison is ready to live and resolves to drag Honor along with her. Alison and Ed have grown apart during their time in Yemen. Will they find their way back together? At the opposite end of the spectrum is Mary Markham (Drew). This ideal officer’s wife is the embodiment of loyalty and duty. As such, everyone turns to her for her advice and assistance. Still, her fortitude will be severely tried, when her own family is at stake. Mary’s husband, Major Harry Markham (Miles) is the unit’s Commanding Officer. He feels a great sense of accomplishment that he has never lost anyone in his charge. How Harry will hold up, should that change, remains to be seen. As the insurgency intensifies, these officers and their families must confront difficult questions. They begin to wonder why they are in Yemen, whether they should be, and if it is even okay to ask these things. As the norms of the 1950s drift away like dust on the wind, who will thrive and who will falter? Stay tuned. What do you think? Do you like The Last Post TV series? Should this BBC One and Amazon TV show have been cancelled or renewed for season two? Great show! Please bring it back. I watched the entire 1st season in 3 nights. It was amazing acting and a wonderful story line. How in the world could the BBC cancel this amazing series? I hope Amazon picks it up and continues making this wonderful program!!! This series desperately deserves many more seasons to come. Engaging storyline headed by great acting. Please bring this back so I continue to have some hope in BBC making the right decision for its viewers. Please do not stop the series The Last Post. We enjoy very much and we value the work, talent, excellent writing and the depiction of the two cultures. BBC is well known for serious series and close to real life situations. Dear BBC, please do not make Amazing shows and then not finish it out. We will just learn not to watch in the future because we won’t trust you to respect your viewers. Why fall in love with characters and plot if you know these makers will just leave you hanging? Same thing with Home Fires. So sad -Loved this show!! !please bring it back. Serious ? Finally a series without Hollywood schlock and it’s dropped ? I just ripped through season 1 and absolutely love it! BBC please make some more seasons! No! Dont cancel this show! It’s an exquisite piece. Bring it back to life. Please. Seriously, canceled? Best acted show with characters who engaged you, great story line, just watched it on Amazon Prime for the first time, and it’s canceled? BBC needs to re-evaluate it’s decision and go forward with producing this show! Really enjoyed the Last Post and was looking forward to season 2.. It made a change from the cookie cutting crime series or constant talent and reality shows.. I assume cost was the driving factor.. So sad!